Phacelia seedlings can tolerate light frost, but the plants are easily damaged by hard freezes. When growing phacelia to improve very poor soil, mixing a balanced organic fertilizer into the soil before planting will give better results. Cucumber, Tomato, Kale, Broccoli and Cabbage. Mixes well with other cool-season flowers such as orange calendulas, or you can use phacelia as a cover crop or bee plant. Sow phacelia in spring while the soil is still cool. Make sure seed is well covered, because phacelia seeds need darkness to germinate. Broadcast seed into cultivated soil so that the seeds are about 2 inches (5 cm) apart and one-fourth inch (0.5 cm) deep. Thin to 10 inches (25 cm) apart in all directions. Limit reseeding by pulling up or turning under phacelia just after it blooms, but before it develops mature seeds. Phacelia can be pulled up and composted or turned under any time. Pull up individual plants grown for flowers before they shed seeds. 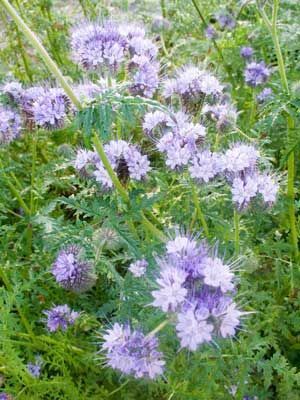 Phacelia has few problems with pests or diseases, but expect plant to be abuzz with bees and other beneficial insects.